Free Extended Warranty - Double your warranty to 24 Months when you register your Cash Register Online. Casio Cash Register SE-G1S are the first in their class to be equipped with a thermal printer that offers quiet operation and attractive output. store names and phone numbers. Environmentally Friendly Eco-conscious product design with compact size and use of recycled materials in the cash register body and packaging. Easy-to-read large LCD display at the height of 25mm with 8 digits. SE-G1 registers are the first in their class to be equipped with a thermal printer that offers quiet operation and attractive output. Drop-in paper loading is convenient and effortless. Antimicrobial keyboard conforms with ISO 22196 standard. A multipurpose tray helps keep the cash register area neat and tidy. The TAX PGM key makes it easy to set the tax rate and current date and time using an interactive menu. User-friendly design makes it possible to quickly prepare a register for use. Support for up to 999 price lookups (PLUs) makes these registers suitable for use in shops carrying a wide variety of products. Customize receipts by adding messages, store names, and phone numbers. click the link below for youtube video! We can also programe your new cash register ! 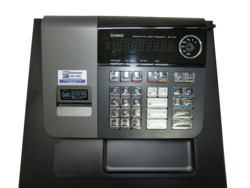 If you select the programming option for this cash register, our service team will setup your Casio Cash Register SE-G1S before we ship it. This includes: Receipt Message, Departments, Key Button/Keyboard Design, GST Programming & Graphic Logo (If the machine is compatible). You can email your menu to us or we will contact you to discuss what we require to make sure your new Casio Cash Register SE-G1S is setup correctly .